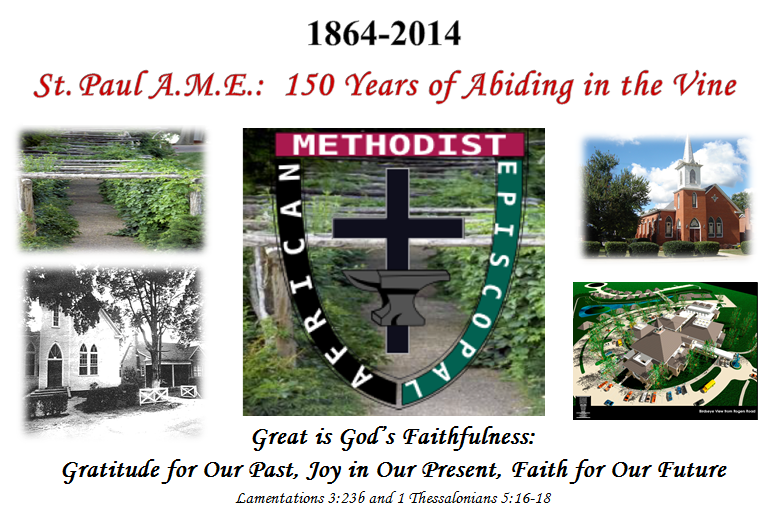 St. Paul a.m.e. church: "150" years of abiding in the vine! I greet you with the joy of the Lord. 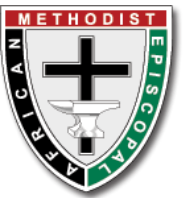 It is my pleasure to welcome each of you to the "150th" Anniversary web site page of St. Paul A.M.E. Church of Chapel Hill, North Carolina. What a Mighty God we serve! I am honored and count it a privilege to be a part of this most historic celebration. From the humble beginnings of worship under a grapevine to this present moment, truly the Lord has been with St. Paul every step of the way. The rich history of St. Paul is a true testimony to the faith that our founding fathers and mothers had in God when they embarked on this faith journey in 1864. 2014 will be a very exciting and busy year for the St. Paul family. We have embarked upon a year-long journey to celebrate our 150th church anniversary. Our theme for this great milestone is: "150 Years of Abiding In The Vine --- Great is God's Faithfulness: Gratitude for our Past - Joy in our Present - Faith for our Future." For 150 years, each generation of the membership have been bold witnesses to the power of Almighty God. Although our history is very rich, our future promises to be even richer. Each month during the year, we will highlight a specific ministry that is dear to us. From great preaching, teaching, worship, health fairs, community gatherings, community outreach, etc., the year promises to most memorable. Please take the time to browse the site for guest speakers, presenters, location, dates and times for the different events. I think the Apostle Paul says it best in 1 Corinthians 2:9, "Eye has not seen, nor ear heard, Nor have entered into the heart of man The things which God has prepared for those who love Him." Again, on behalf of our church family I say welcome! It is our prayer that you will be able to join us at as many of the different events possible. Please know that you are always WELCOME at ST. Paul-- Chapel Hill, NC!!!!!! !